As celebrity engagement rings go, Hilary Duff’s is one that has spent plenty of time in the spotlight since her 2010 marriage to Canadian NHL player Mike Comrie. Their engagement was a short one, lasting from February to August of that year however their long dating history, which began in 2007, more than made up for it. Shortly after they began dating, Mike proved his prowess at gift giving by surprising Hilary with a gorgeous Mercedes-Benz G-class SUV, which he said was an early gift for her 20th birthday. No one was terribly surprised when he presented her with a massive radiant-cut engagement ring estimated to be worth a cool million. Like Hilary Duff’s engagement ring, this beautiful example from Brilliance features a gorgeous radiant-cut center diamond flanked by two side stones. More diamonds embellish the ring’s shanks, increasing the overall sparkle to nearly mind-blowing proportions. Born September 28 of 1987 in Houston, Texas, Hilary Duff enrolled in acting, ballet, and singing classes at a young age. She took roles in local theater productions, and by age six, was participating in a touring production of The Nutcracker. Hilary, her sister Haylie, and their mother decided to move to California to pursue showbiz in 1993, leaving their father behind in Houston to take care of the chain of convenience stores he owned. The girls were cast in several television commercials over the years, and Hilary soon won minor acting roles in TV and movie productions. She landed her first major role in 1998, playing Wendy in Casper Meets Wendy. She received a Young Artist Award for Best Performance in a TV Movie or Pilot after appearing as Ellie in the 1999 TV movie The Soul Collector. In 2000, Hilary landed the title role in Lizzie McGuire, which premiered on the Disney channel in January of 2001. The show ended after 65 episodes were filmed, and Hilary went on to enjoy film roles in Agent Cody Banks, The Lizzie McGuire Movie, Material Girls, and other movies. At the same time, she released singles and albums including her highest-peaking US single so far, “With Love.” It topped Billboard’s Hot Dance Club Songs chart. Did you know that Hilary Duff has launched not one, but two clothing lines? Stuff by Hilary Duff was launched in 2004 and ceased production in 2008, while a limited collaboration with DKNY Jeans allowed her to show her prowess for designing special fashions for teens. Her creativity doesn’t stop with clothing though; she has released a trilogy of novels titled Elixir, Devoted, and True. What Our Experts Have to Say about Hilary Duff’s Engagement Ring. Hilary Duff’s engagement ring appears to feature a radiant-cut diamond in the ten to twelve carat range. According to an unnamed source for Us Weekly, the ring cost Mike close to a million dollars, although that figure has never been officially confirmed. 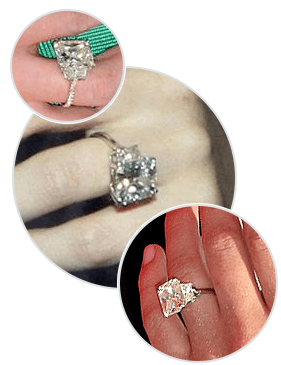 Because of its large size and extraordinary sparkle, it’s one of the most coveted celebrity engagement rings there is. Hollywood engagement rings never fail to amaze, and for some, they may seem completely out of reach. The fact is though, that despite the high price tags often paid by celebs, it’s completely possible to get a similar look with an affordable, custom engagement ring from Brilliance, which also offers a number of popular designs. Whether you choose a replica of Hilary Duff’s engagement ring or choose something completely different, you’ll be sure to enjoy its sparkle for life.